Koi fish are large Japanese carp that are known for their beauty and size. These fish grow up to 3 feet long in outdoor ponds if they have large enough environments. Keeping 200 gallons of water per full-grown fish makes sure the pond is not overstocked with fish. Koi grow rapidly, so the size of the pond needs to be planned before the fish are purchased. The fewer the fish, the better the water quality. Koi need filtration for their home to remain healthy and clean. Koi are messy fish, and their wastes turn a clean pond into muck. The filter chosen depends on the size of the pond, and each filter is labeled with its water filtration capacity. Healthy ponds have zero percent nitrites and ammonias, and the pH balance of the water needs to range from 6.6 to 8.4. Checking pH levels a few times each month is important. Koi love to eat plants, so the pond should be stocked with plants that are non-toxic and spread fast. This way the koi can enjoy salad each day and still have plenty of air in the water. It's important to research the types of safe plants that koi don't like to eat, because live plants help keep the pond free of toxins that constantly grow in outdoor ponds due to poor oxygenation and poisoned water. Koi are large so they are hearty eaters. They consume algae, insects, snails, worms and koi food pellets. 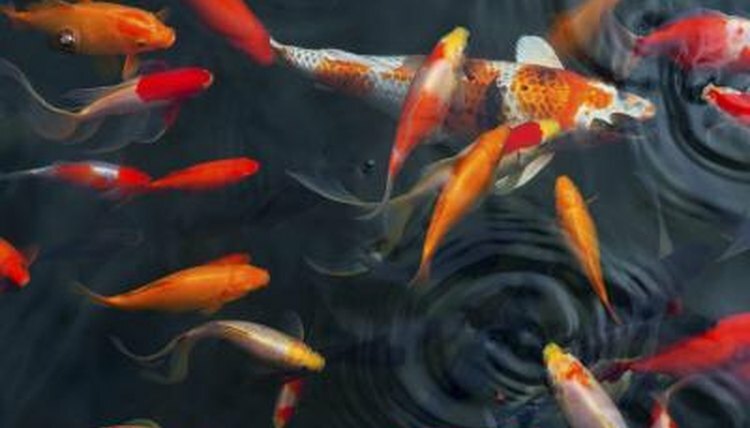 It's important for the health of the fish to give koi a high-fat, high-protein diet to help maintain their body temperatures and energy levels. If the weather turns hot, the fish eat less, and the same applies when it gets cold. If the weather remains stable all year, the koi's appetites will remain about the same. In spring, debris becomes apparent in the pond. Dead leaves, rotting vegetation or clumps of algae float up from the bottom. Debris reduces the breathable oxygen in the water so it needs to be removed. In winter, koi must have air, so if the pond freezes over it's essential to use a warmer to thaw a hole. Some regions get too cold for koi, so in those cases the fish need to be brought inside.